We’re in our New Digs now, so make sure you come along to 31 Chapel Street! 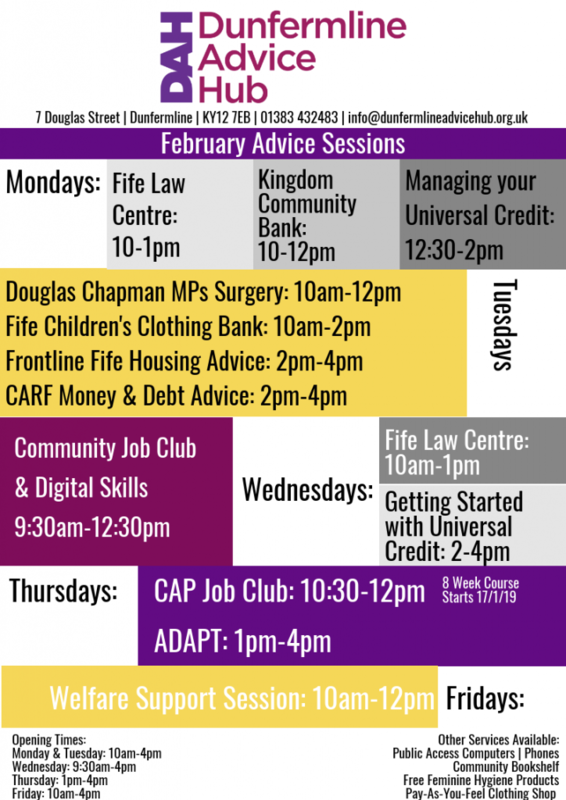 There’s also a couple of changes to our advice sessions – Fife Law Centre have changed their drop in to Friday afternoons, 2-5pm, and Fife Council’s Universal Credit sessions have changed to 1:30pm to 3pm on Mondays (a change from a 12:30pm to 2pm session). Douglas Chapman MP’s Office has also cancelled their session until further notice – understandably with the political turmoil right now! Furniture Plus helped us by moving all our furniture in, and have given us some extra stuff such as rugs and cushions to make our rooms cosy! We also had some offers of help from Fife Council Housing (paint), and TURN and Community Paybank Teams (moving, painting). Thankfully, the office we moved into doesn’t need any work! If you would like for information about using the Hub, or want to find out about how the Hub can help your work in Dunfermline, contact us! Reception - a warm and welcoming space for all Users of the Hub. Information Library - for everyone to use, sorted out into themes so information is easy and quick to find. It was a pleasure to host and facilitate our Movin on Up sessions, and we hope that our participants enjoyed it too! There was a great amount of enthusiasm from everyone who attended, especially around how we can work better together, so we’ve got lots of work to do to help ensure that happens. Here’s a report of the sessions, what was said and ideas we’re taking forward. If you’d like more information or would like to take part in our partnership activities, please get in touch. 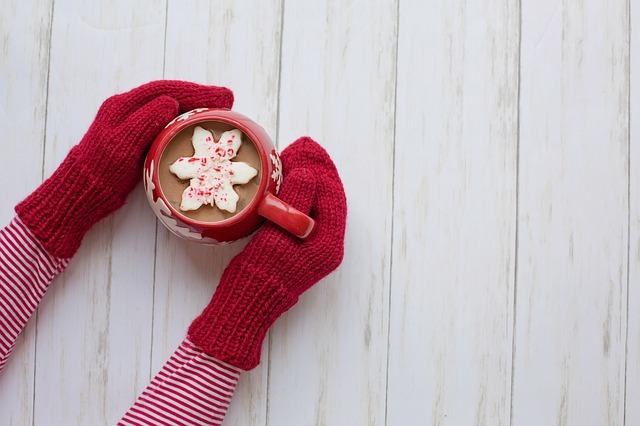 Its still chilly this month, but thankfully a short month for most who get paid monthly. The Hub was quite busy, nearly 300 interactions, and advice sessions are being well attended (especially Kingdom Community Bank and Community Job Club). We’re still seeing a lot of people who are struggling to make ends meet and having to access local food aid, such as the foodbank, and benefits problems – a lot of what we see are people who are confused about their entitlement or are struggling with Universal Credit. We’ve outgrown our venue at 7 Douglas Street, and we’re moving to 31 Chapel Street, in with our partners Conduit Scotland. And aside from the logistics of moving and the practical aspects of sharing a space, we’re working hard to try and establish new agreements, based on strong principles of collaboration. 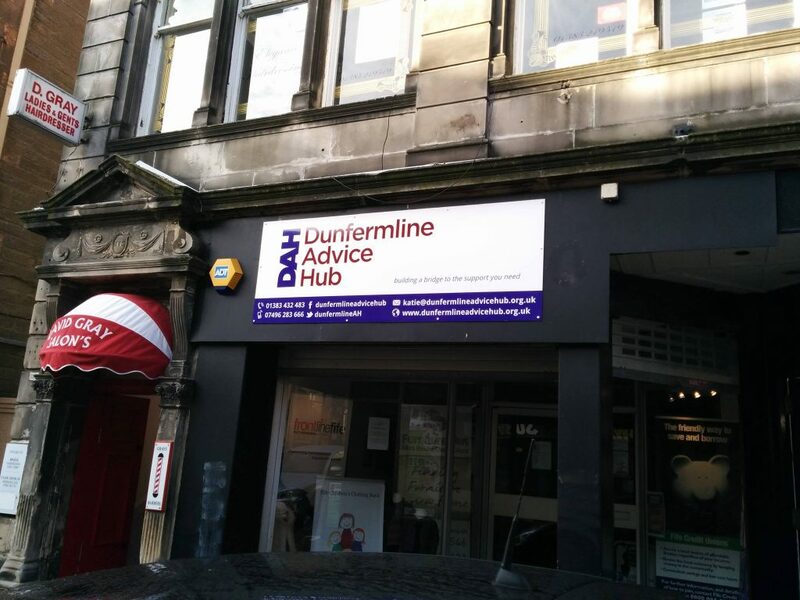 The Dunfermline Advice Hub has been more than just a venue – we offer a wide range of additional services, mainly being a central point of contact for information and signposting for the Dunfermline area. Our partners will be benefiting from not only a free venue, but improved access to new and untapped citizens in need of their services. However, up to this point, we’ve had a very casual approach to our stakeholders using the Hub – we’ve not had official service level agreements or partnership agreements. From our stakeholder activities over the years, the feedback from our stakeholders have been that they were reluctant to sign up for official agreements, as we’ve not charged for our venue, and our requirements have been more about collaboration instead of cash. So, in order to cultivate trust, we’ve had a casual arrangements where users of the Hub are given an induction and a user guide, and more recently, we’ve developed our Memo of Understanding (see blog post on the MoU development). This approach has been successful in some ways, where we’ve now worked with over 70 organisations across Fife, but there have been challenges, such as sustainability and capacity issues. So where do we go from here? In our new venue, we hope to introduce a new User Agreement. In our cash-strapped climate these days, organisations and charities are working more with less, so we have to be innovative in what we can negotiate in return. We’re in the very privileged position that Conduit are offering fantastic accommodations for us for free, so we won’t be asking for money or physical resources for room hire. We want to share our excellent fortune, but as the Hub is much more than just a venue, we will be asking our stakeholders for asking for support in different ways – free awareness training, signposting to our service, sharing of our social media posts, opportunities to promote our service at events and staff meetings – there are lots different ways to contribute that don’t cost much, but mount up to a huge impact for all of us. Collaboration and cooperation is our CORE. From our inception from the Dunfermline Poverty Action Group, to working with the Local Authority Support Team at Scottish Government, to our Partnership Project funded by Aspiring Communities, we have been trying new ways to challenge silo working, increase knowledge, confidence and skills in signposting, and to cultivate an ethos across organisations of “no wrong doors”. To help do this, we’ve planned three events – 18th Feb, 27th Feb, and 8th Mar, where we’ll be discussing with a wide range of our partners on how we create User Agreements that work for us both, and crucially, works to improve all our services to be better, serve our community better, and increase our mutual value and impact. We’re having a clear out! Did you know we’re moving?! We need some kids clothing stock shifted ASAP, so we’re giving away bags of clothing that we’ve got in excess FOR FREE! We also have a mixed box of hats and gloves and another box of mixed leggings. All our clothing is donated by the community, so we ask that folks don’t take more than they need, and they don’t sell or profit from the clothing they get for free here. Share this with everyone and anyone! Someone might be in need that you don’t know about and discretion is assured! We’ve got a new look report this month! We collect a lot of stats on the people who attend the Hub, what sessions and the reasons they need help, which can be a bit overwhelming! However, we’re seeing recurring reasons why people are attending the Hub, so we’ve developed a more thematic approach to these reports. For those who asked for information, Food Aid was the most requested topic (17%), followed by Benefits (13%) and Information on a specific service (10%). This shows us that people are still in desperate need for food, such as foodbank assistance. The biggest reason for people having to access information and support was a Change of Circumstance – this is quite vague when taken on face value, but it covers a range of reasons such as family breakdown, change in working hours, loss of job, etc. What this shows is that a small change of circumstance for some people can mean a huge impact, resulting in having to access urgent support, such as the foodbank. This is a challenge for us as support services, to offer more preventative services, and help people to become more reslient to sudden changes or financial shock. The second biggest reason reported was low income and money not going far enough and the third, homelessness. If you would like any further information on this report, how we use statistics, and how we interpret them, please get in contact with us here. We’ve got lots in store for January, so if you’re needing help or feeling the pinch after Christmas, pop in today to see what solutions are available for you! It has been a long time coming! 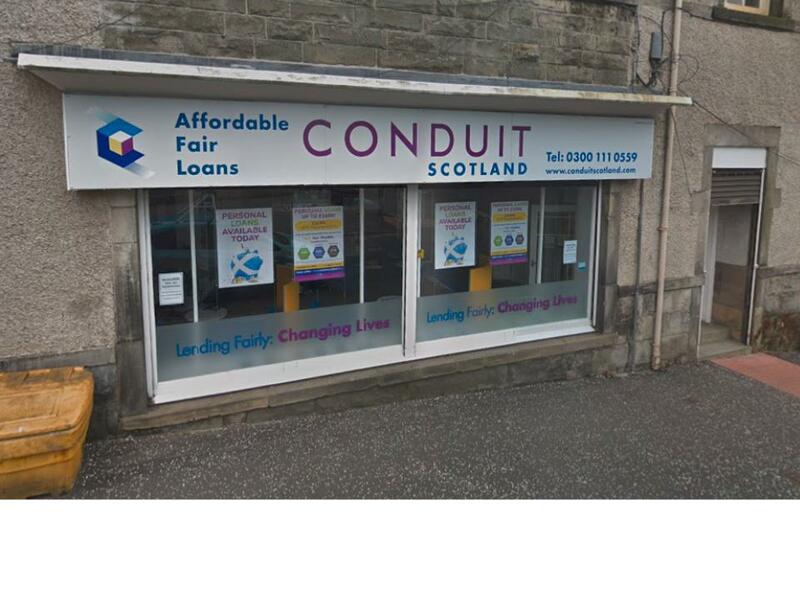 We are delighted to announce that we will be co-locating to Conduit Scotland at 31 Chapel Street, Dunfermline. 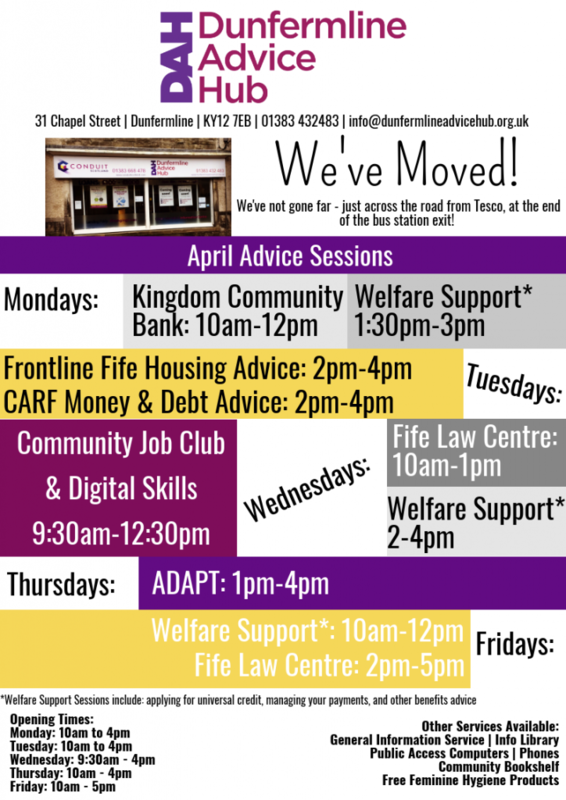 This is wonderful news for the Dunfermline Community, as everyone will have access to a wide range of financial, social inclusion, advice and support services, all under one roof. We hope that working closely with Conduit Scotland, we will be able to offer an even wider range of services, and be able to accommodate many more services, advice sessions, groups and events in a better venue. For more information, see the statement of intention below or contact Katie, Hub Coordinator, on 01383 432483. For a full statement of intention from our Steering Group, please click here.